Results from lifecycle based environmental assessment are increasingly being expressed through the use of economic terminology. Every second year a new buzzword takes the stage. In this blog-post I try to provide some clarification on two recent buzzwords: E P&L (Environmental Profit & Loss account) and NCA (Natural Capital Accounting). In 2011, PUMA (the shoe-maker) launched their E P&L, a practice that was followed by several others, including Novo Nordisk and the Danish Fashion Industry. The intention is to complement the company’s normal Profit & Loss account (the financial statement of the income and costs) with an account of the monetarised external benefits and costs related to the life cycle of the product portfolio of the company. Formally, an E P&L should thus be called a ‘Product portfolio E P&L’, which could more lengthily be described as a ‘Product portfolio environmental life cycle assessment with monetary valuation of impacts’. Except for the monetary valuation of the impacts, an E P&L is thus equivalent to what the European Commission calls an Organisation Environmental Footprint (OEF). In 2013, September 27th, The Guardian had an article stating: “If you are looking for the next big thing in sustainability, you needn’t look much further than natural capital accounting”. Last year, in December, the European Commissions Business and Biodiversity Platform published a guide to NCA (Spurgeon 2014), in which E P&L is mentioned as one possible Natural Capital Accounting approach. However, capital is essentially a synonym for resources, i.e. those things that enable us to produce goods and services. 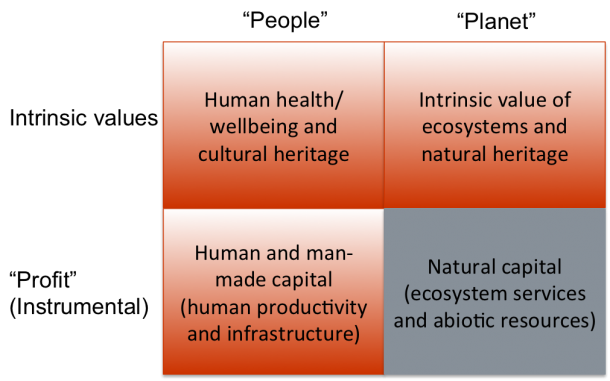 Natural capital thus covers abiotic natural resources as well as ecosystem resources that provide us with ‘ecosystem services’ – another buzzword that now has been around for 10 years. As such, natural capital only has instrumental value and the term cannot sensibly be used to cover the intrinsic value of nature, i.e. the value that we place on nature in itself and not for what it can produce. And even more obviously, natural capital cannot sensibly be said to cover the value of the non-natural areas of protection, whether intrinsic (human wellbeing and cultural heritage) or instrumental (man-made and human capital) and thus NCA should never be able to aspire to cover all impacts on these areas of protection. The below table clearly shows how impacts on natural capital are only a (small) part of the whole picture of environmental impacts. In the table, the different areas of protection are related to the popular “people, planet, profit” concepts. Now we can only hope that the readers come as far as this caveat and do not take the definition out of its context. For my part, I will continue to say that we do ‘Product portfolio E P&L’s and that NCA in its more narrow definition is a part of this. Spurgeon J P G. (2014). Natural Capital Accounting for Business: Guide to selecting an approach. Brussels: EU Business and Biodiversity Platform.